To create a distinguished finished product out of every commercial and residential exterior through meticulous, impassioned craftsmanship. Here at DLC, we believe that people are our most important asset and we treat each of our employees as an extension of our family. If you have questions, comments or anything you’d like to tell us, please write us a message. 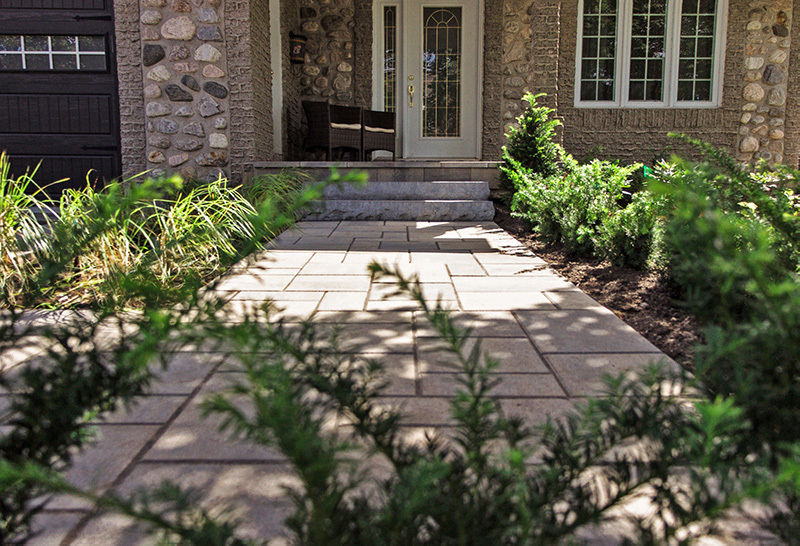 Here at DLC, we offer the full package: designing, building and maintaining your landscape to create timeless outdoor spaces. The two halves of landscaping. DLC Greenteam employs a philosophy of “Design, Build, Maintain” to create impeccable work that our customers can be proud of. Each step of our process is crucial in delivering a product that meets our standard for excellence. 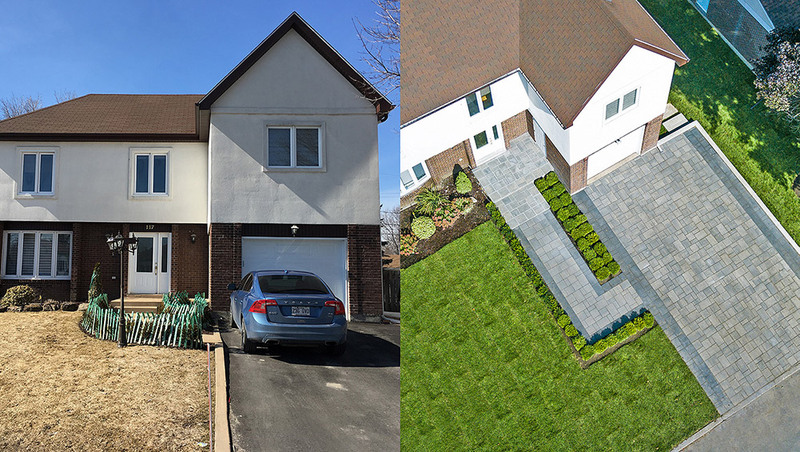 From design through execution to aftercare, we’ve worked hard to earn our reputation as Montreal’s one-stop landscaping shop. 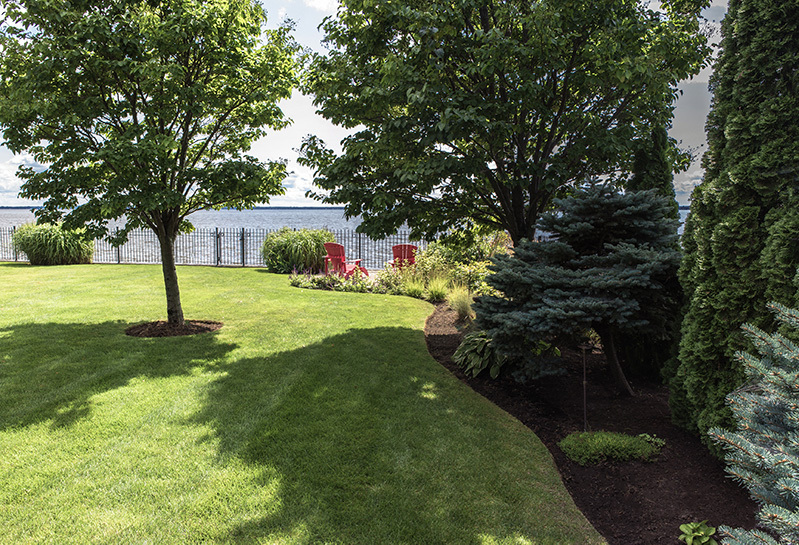 At DLC Greenteam we strive to see our clients thrilled by their landscapes. Our motivated professionals are committed to presenting unique concepts and unparalleled service through a process built on integrity and trust. DLC offers a full range of lawn & garden services. 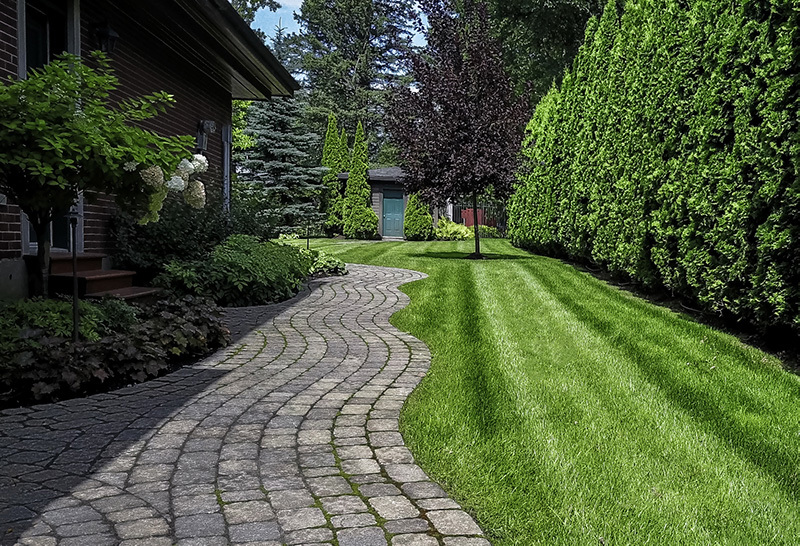 Whether you have a beautiful lawn that requires expert maintenance or you would like to see significant improvements to your lawn, DLC is the first step towards a manicured space that will be the clear envy of your neighbors. 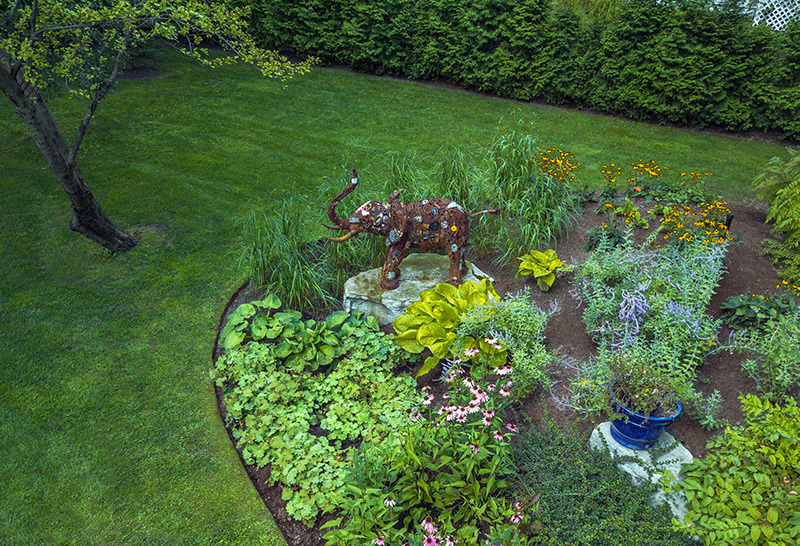 DLC offers a full range of lawn care services. 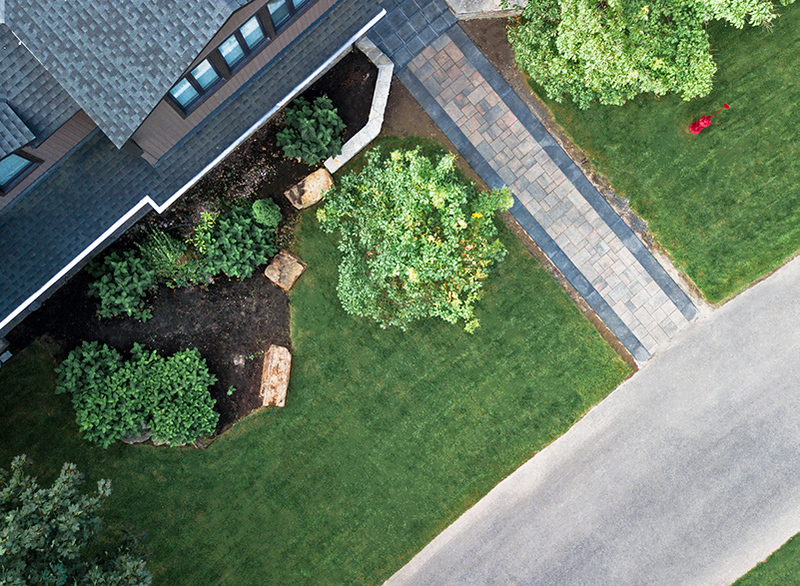 Whether you have a beautiful lawn that requires expert care or would like to see your lawn improve, DLC is the first step toward a manicured lawn that will make your neighbors clearly envious. 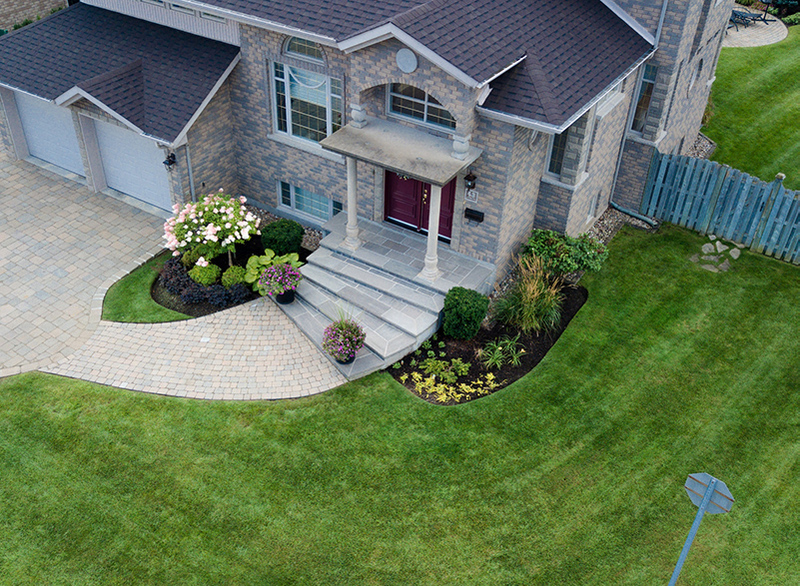 Scroll down to discover our wide range of lawn services. With time, the soil beneath your lawn becomes compacted. This compaction limits the flow of air and nutrients to your lawn’s roots. Our Aeration service removes small cores from the soil to reduce compaction and allow the roots to spread, receiving the airflow and nutrients they require. Aerating will help you build a lawn with a strong root system that is healthy and resistant to drought. It’s the perfect way to prepare your lawn for topdressing. Over time the nutrients in soil are depleted and your lawn may begin to thin out, becoming easily affected by disease and drought. Our Top Dressing service will help restore important nutrients and microorganisms to the soil, enabling your lawn to grow thick and lush. Our team will spread a layer of quality compost and grass seed over your land, restoring the nutrients it needs to stay full and lush all season long. For best results, top dress after a lawn aeration. Once the snow has melted, your lawn is likely to be matted with leftover debris from the previous fall. Our crews will thoroughly clean and prepare your lawn for a healthy growing season. Twigs and debris will be collected and removed from your property; the lawn will be raked and dethatched to loosen up the grass, allowing air to circulate and encouraging it to start growing for the season. Not only is a thorough spring cleanup important for your lawn and garden, but it will give your property a tidy appearance. On a regular weekly schedule, our crews will cut the grass. This includes trimming all edges and blowing debris off of paved areas. The clippings will be removed from the property, eliminating heavy bags of grass to store until municipal pickup. This service will not only keep your lawn looking neat and tidy, but proper mowing practices will ensure that your lawn is in peak condition at all times throughout the mowing season. Our mowing crews are equipped with well maintained, industry leading equipment, allowing them to stay on schedule and deliver the best service possible, even during peak season. Our lawn maintenance team members enjoy their work and take pride in delivering a reliable and professional service. Once the grass has slowed down and leaves have begun to fall, our crews will begin scheduled fall cleanup visits. On each visit, leaves will be removed from the lawn, garden beds and paved areas. We offer fall cleanups on a weekly, bi-weekly or one time basis. Top quality equipment enables our crews to remove leaves from your property thoroughly and efficiently. Our leaf removal crews are supported by vacuum trucks that will come to your property after the crew has piled the leaves at the roadside. 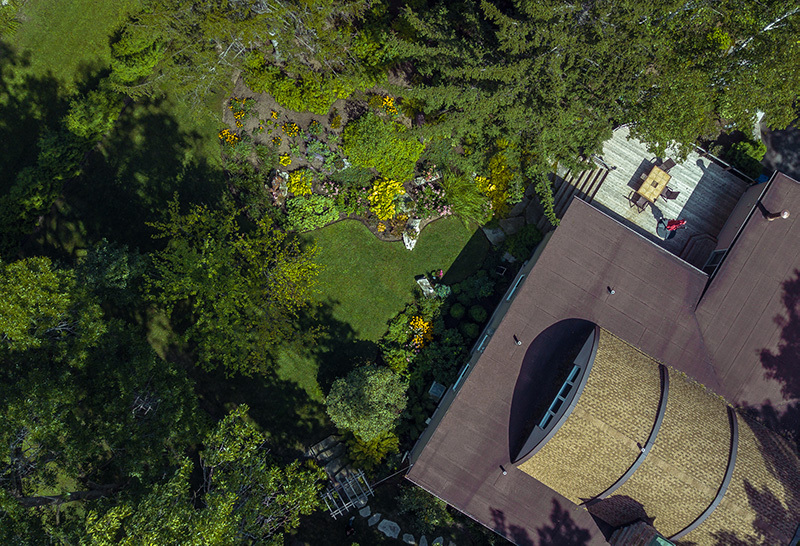 We pride ourselves in delivering the best fall service in the West Island, ensuring that all of our clients’ properties are clean and ready for winter before the first snowfall. DLC offers Fertilization and Weed Control programs that help to give your lawn a deep green color and minimize the development of weeds. Both seasonal programs and one-time applications are available depending on our clients’ needs. We also offer specialized treatments, such as grub control. Your lawn and gardens need water to sustain them during the warm summer months. Providing the right amount of water will promote the best growth possible. Both over-watering and dry spells can be equally damaging. Our experts can help you to determine the correct water requirements for your lawn and gardens. It’s no secret, a proper garden requires regular maintenance and a little know-how. Our experienced gardeners will care for your garden from the first signs of spring until the last preparations have been made before winter. DLC offers a full range of services to keep your gardens looking their best every time you look their way. After a long winter, your garden is just as excited by the warmer weather as we are. Let our Garden Opening Service help you get your garden off to a great start for the growing season. Our gardeners will remove winter protection materials, edge the garden borders, turn the soil to relieve compaction from snow load and complete any spring pruning as required. A strong start will help to ensure that your garden is healthy and looks great throughout the season. Our gardeners will visit your property and service all garden beds and plantings in detail. Weeds will be pulled, soil turned, spent flowers removed and shrubs pruned as required. The garden edges will be kept well defined. Our goal is for your gardens to look outstanding from spring to fall. Our certified horticulturists are trained in proper horticultural practices and know the ins and outs of garden maintenance, allowing us to deliver a superior value in our service. Not only will your space look great after each service, but you will see an overall improvement in the health of your gardens with time. Throughout the season our crew leaders will note any obstacles or items that need attention so that we can promptly recommend measures for improvement. DLC offers seasonal plantings to boost the level of color in your gardens during periods of the growing season that naturally have very few plants in bloom. From early spring until the snow arrives, our seasonal plantings will give your landscape a colorful touch. Bulbs - For early blooms that will appear with the first signs of spring, we offer bulb planning. Bulbs must be planted at the end of the year and are always a welcome sight after a long winter. Annuals – A great choice for adding color to garden beds or for potted arrangements, annuals will add some colour to your landscape during the summer months. Chrysanthemums – With the arrival of cooler weather, perennial plantings finish blooming and will be cut back for winter, leaving your gardens bare. Chrysanthemums or ‘mums’ are a great way to dress up your landscape for the end of the season and will add plenty of character until the snow arrives. To keep your garden looking its best year after year, it is important to return nutrients and organic matter to the soil. As the growing season comes to a close, it is an ideal time to work compost into your garden beds. Our Garden Composting service is an important part of your garden maintenance program. Our Team of experienced gardeners will carefully mix compost into your garden beds. Adding compost will help to ensure that your plantings bloom fully and that the soil has proper composition to be able to hold the moisture that your gardens need. Hedges and shrubs make up an important part of your landscape. Proper maintenance for these larger plants is key, as it will ensure that they mature well and add to the overall appearance of your landscape. Hedges must be pruned in order to prevent them from developing poor form and becoming over-grown. Our gardeners will prune both coniferous and deciduous shrubs and hedges as required, at the correct times, throughout the growing season. Our Hedge and Shrub Trimming service is available as part of our regular garden maintenance program or as a one-time service. As the growing season comes to a close and your gardens start to go dormant, our gardeners will begin preparing for winter. Annuals will be removed and perennials cut back. Sensitive plants and shrubs will be protected for the winter. Properly closing the gardens helps ensure that they will be best able to cope with the harsh winter months and minimize snow damage. With the passing of time, gardens mature and their maintenance requirements change. A garden that has reached full maturity may begin to require a high level of maintenance to prevent it from interfering with other elements on the property, such as pathways and scenic views. In some cases, the major elements of a landscape are in place and in good condition, the plantings simply need to be altered and updated. 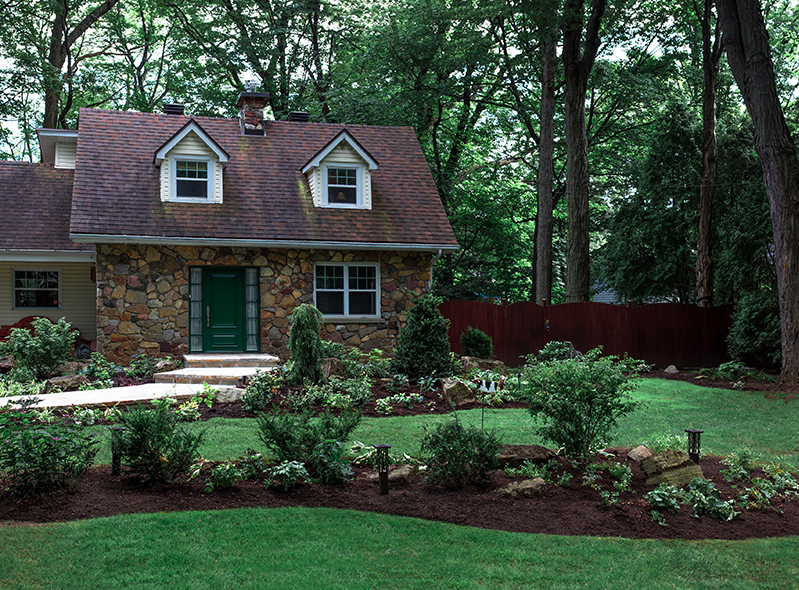 Our Garden Renovation service is the perfect solution, giving your landscape a makeover without a total re-construction. We will meet with you and discuss your landscape and the potential for a renovation. We will take stock of the current plantings and major elements in your landscape. 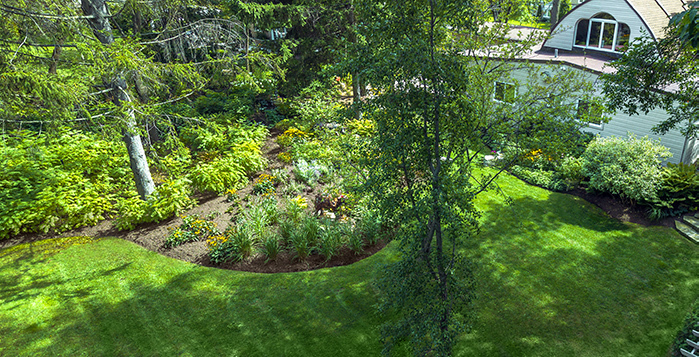 In some cases we are able to preserve large, mature plant material and combine it with new plantings to create a beautiful garden that has unique appeal and interest. At the same time, we will amend the soil to ensure that your new gardens will be healthy and full. 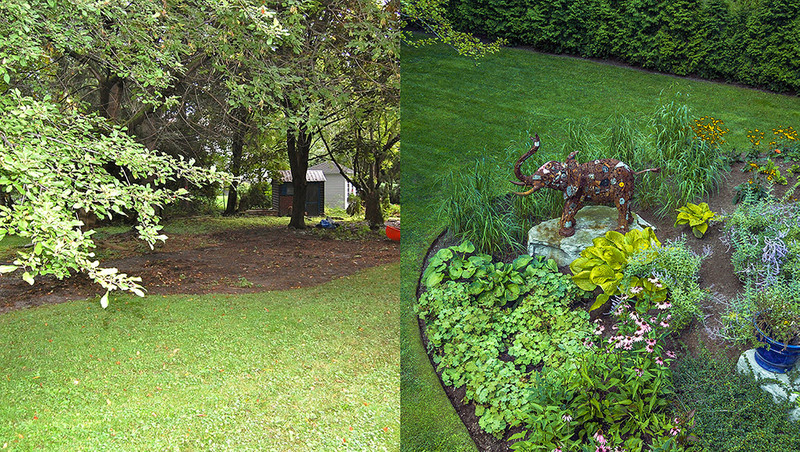 During a renovation, we are able to modify the outline of garden beds, adding or removing beds entirely. 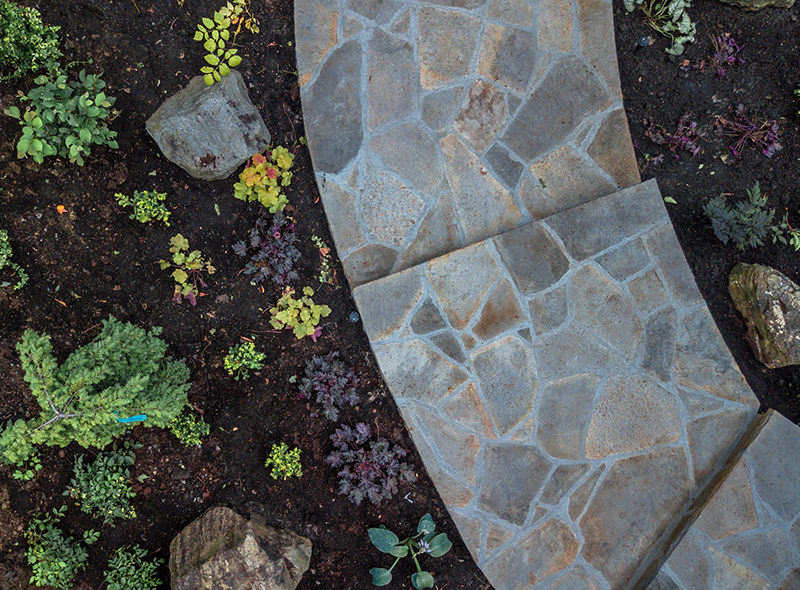 Whether you have existing garden beds that need a fresh look, or a landscape that is very minimal, call us today to see what we can create for you. Sound techniques and great workmanship are only shades of what DLC Greenteam can offer. Delivering a great product requires a simple, obstacle-free process. At DLC our focus is on creating timeless work of the highest caliber. We do that with love, care and devotion. We know that coordinating multiple contractors through every aspect of your project can be stressful. That’s why we believe that delivering a great product requires a process free of inconveniences. The first step of any great project is a great design. This is where we explore ideas, help visualize the outcome and create the best value from your budget. Nothing will be left to chance - each component of your landscape will be carefully designed to suit your lifestyle. We will coordinate your entire project with no detail overlooked. Sound techniques and great workmanship are rooted in our philosophy. A landscape plan is one of the most important investments you can make when planning the exterior of your home. When you hire us to create a landscape plan for your project, we combine our expertise with creativity and innovation, resulting in an outstanding outdoor space, and ultimately the most value for your landscaping budget. Projects that are completed in stages by multiple contractors and without a comprehensive plan often leave details mismatched or unfinished. Taking on a landscape project without a plan will often result in a higher cost and lesser end result. 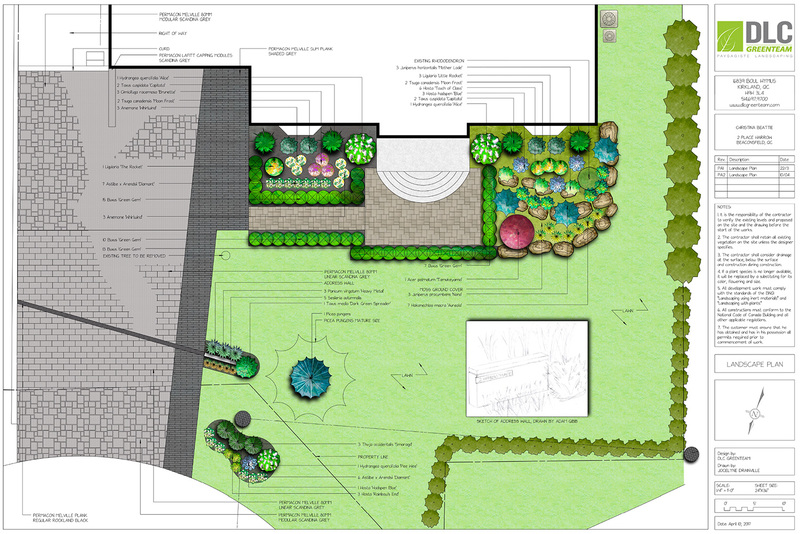 Our design service is the first step towards an outstanding landscape. Our designs are based on you. This means listening carefully to your ideas and goals for the project before beginning a plan for your space. We will provide you with a concept and together we will hone the concept into a final plan. This final plan is an essential part of your project, allowing you to clearly envision your project and to adjust the budget through the selection of materials. The plan will also serve as a guide for completing the project in multiple phases, without the need to re-do any of the components that have already been completed. Most importantly, the landscape plan will ensure that the end result is an outstanding space where all of the elements blend together seamlessly and you can enjoy your outdoor space for many years, hassle free. 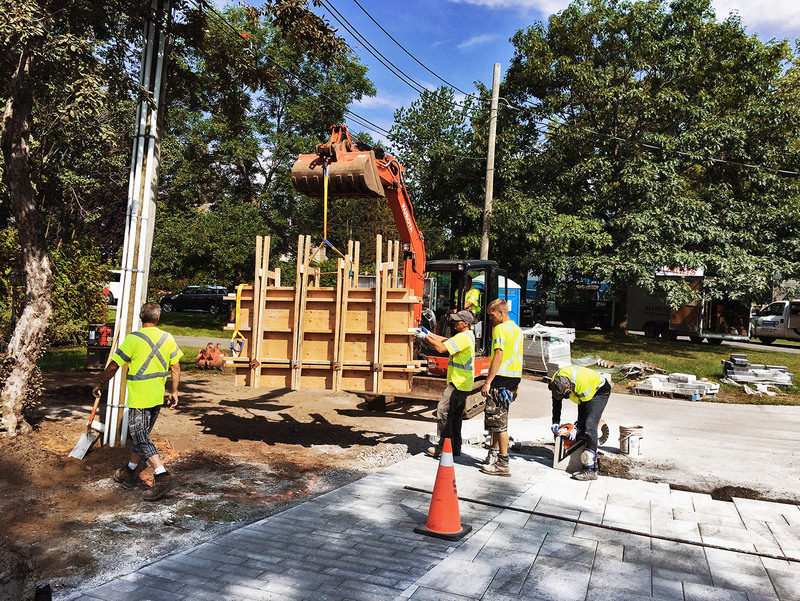 Our construction crew combines wood, stone, metal and plantings to create beautiful outdoor spaces for your family to enjoy. 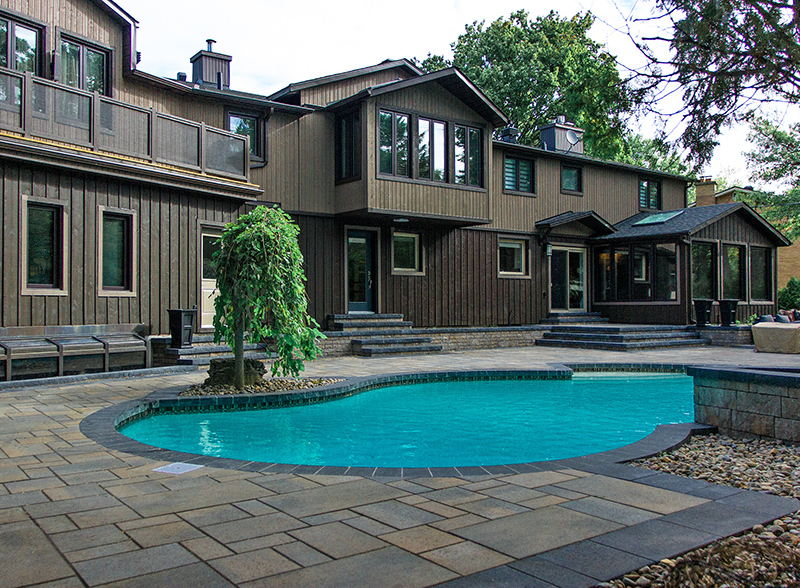 Whether you hire us to build a small patio, or an elaborate outdoor retreat, you will receive the same excellent workmanship resulting in a beautiful final product guaranteed to age gracefully. We enjoy being challenged to build new and innovative spaces, pushing the limits to provide you something that is truly unique. During the construction stage, it is important to us not only to deliver a great product but also a great process. That means that we maintain a clean and professional worksite and do our best to keep your project on schedule and on budget. A great landscape involves many elements. Bringing all of these elements together to reflect the landscape plan requires careful planning and coordination. We offer our project management service so that you can be at ease, knowing that every detail will be looked after and that your project will be completed on schedule. We will coordinate with all of the contractors involved in your landscaping and home construction to be sure that everyone is able to work as efficiently as possible and that every detail of your landscape plan is properly executed. When you take advantage of our expertise in this area, you are in the best position to have your project completed on schedule and avoid budget overruns. 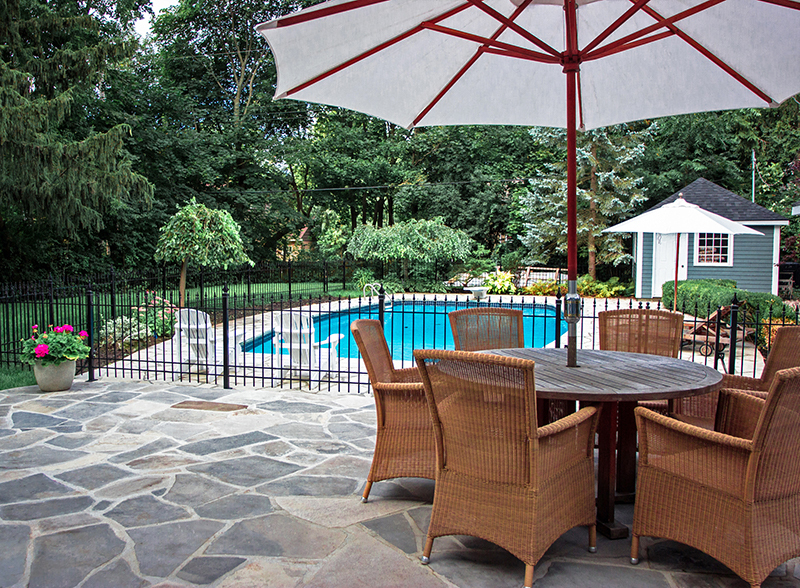 Choosing the right contractor to transform your backyard into your own private outdoor retreat involves more than simply focusing on the end result. A great design and quality of work are important, but they can be tainted by a process that is full of headaches and inconveniences. Our goal is to make your project an enjoyable experience. We believe in delivering our creative designs and excellent workmanship through a process that is pleasant. Our process is firmly rooted in honesty, integrity and professionalism. This means that we are thorough when estimating project costs and construction timelines. We stand behind our work. From planning to completion, you will benefit from our experience and attention to every detail. When you choose DLC to build your dream landscape, you can start relaxing right away, knowing that you on the way to a great space. From maintenance through to construction, our team is equipped to meet your needs. We can do more than mow a mean lawn. 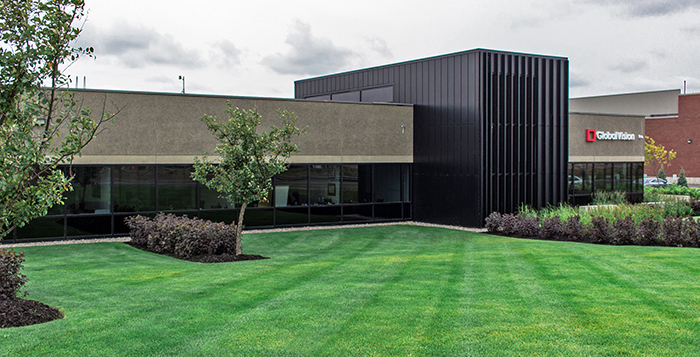 DLC's goal is to create a distinguished finished product out of every commercial and residential exterior through meticulous, impassioned craftsmanship. We’re committed to beautifying your outdoor, and we do that through our straightforward, transparent, worry-free service. Copyright © DLC, 2019 All Rights Reserved.